A portrait of President Bashar al-Assad among the trash in the Syrian city of al-Qsair in 2012. Listen to Suzette Grillot's and Joshua Landis' conversation with Joseph Bahout. Bahout emphasized there’s a danger in oversimplifying the civil war as simply being sectarian, or a conflict between the Assad government and dissatisfied citizens. He also said it’s short-sighted to expect the issues to simply work themselves out. “If this fire is not extinguished quite quickly, and this conflict really solved or confined to an acceptable level, it will become unbearable and unmanageable on the regional levels, and maybe on international levels,” Bahout said. He also says Syria could inspire other conflict zones in the region to resist a peaceful solution if they can use the country as a battleground for their own disputes, like Turkey vs. other Arab states, or Sunnis against Shi’as, and Russia wanting to play a role on the world stage that has nothing to do with Syria. SUZETTE GRILLOT, HOST: Joseph Bahout, welcome to World Views. JOSEPH BAHOUT: Thank you for having me. GRILLOT: Well, I'd like to begin, given you're from Lebanon, and have spent a considerable amount of time in the region, and an expert on Middle Eastern affairs, to talk a little bit about Syria - the crisis going on in Syria - and its impact on what's happening in Lebanon. Can you give us the lay of the land as it looks right now? BAHOUT: In fact, what's difficult to understand about Syria is that it has become a real multi-layered conflict. You have several levels of understanding. The first one is, of course, it started as a revolution, like any other Arab revolution. Society against a very authoritarian regime, and then it turned out to be a weaponized conflict between this regime and its society. And then a civil conflict, or a civil war between several clusters of this society. And then a proxy conflict which is regional, and today international. This is why sometimes it's difficult to sort things out. Now, on the regional level, of course, Syria has become really a kind of cauldron that is today producing a lot of, let's say nasty, things for the environment. First of all, the refugee issue, which is becoming really alarming and appalling. It's more than a time bomb. It's a bomb now, today, with more than 4 million people displaced outside the country and 4 [million] inside the country. With also a lot of, let's say interferences from the neighboring countries in the Syrian conflict under the form of sending fighters, weapons, money, things going out from Syria toward the neighborhood. And this is where, in fact, Syria is no more Syria. It is no more the conflict about Syria, or a Syrian conflict. It has become really a regional conundrum and a regional crisis that is maybe threatening, now with a Russian intervention, to become an international crisis. So I think that understanding Syria needs to really look at all these levels, and really focusing on one of these levels could be misleading - intellectually and probably politically also. JOSHUA LANDIS: We've heard a lot about Hezbollah. One-third of the population of Lebanon, Shi'ites. Some belong to Hezbollah. Hezbollah has entered into the Syrian Civil War on the side of Bashar al-Assad and his state. Because theoretically, they're Shi'ites, or offshoots of Shi'ites. And Iran supports Syria, and their government, and supports Hezbollah. But this is a third of Lebanon, in a sense, participating in this Syrian war. How do the rest of the Lebanese...what are the Shi'ites doing, first of all? Why are they doing this? And what do the rest of the Lebanese think of this? BAHOUT: First of all, you know, when we talk about Lebanon and the numbers and the figures and the shares of communities, etc. we have to be very careful. One-third is a point of view, it's not a fact. It's very debated. We don't know what exactly are the demographics of Lebanon. Some people are saying that it is one-third of Shi'a, one-third of Christian, one-third of Sunnis. Others say that Sunnis and Shi'a are more or less equal - about 25 percent to 30 percent. So it's very difficult to sort out. So let's put that aside. There's no doubt that the Shi'a community today is probably the most powerful community in Lebanon, in terms of demographics. In terms of political weight. In terms of economics, OK, this is without debate. Now the second assumption is that all Shi'as are Hezbollah-oriented, which is also another assumption that is debatable. The Shi'a community is very diverse. Of course, in terms of electoral power, Hezbollah is today the main force because of many things. We don't need to enter into that. Now, to come back to your question, yes, without any doubt, Hezbollah has chosen to get into the Syrian conundrum, and the Syrian cauldron, completely. As of 2011-2012, very, very early in the conflict. And this is a contradiction to what Hezbollah says, that it is only a reaction to the flow of jihadis, etc. It's not true that Hezbollah chose to defend the regime as soon as the summer of 2011. But this aside, I think that what you are raising a very, very important question. What is behind what is at stake in Syria, I think it has become, and this has to do with what we were saying in the beginning, it has become in fact an existential conflict for a lot of forces in the Middle East. When you ask about why are they Shi'as putting their lot and casting their fate on the side of the Syrian regime, of course there's something "religious/sectarian." They are more or less cousins in terms of Ismāʿīlism, which is an exception. But this is not the only reason. For Hezbollah, the potential of having the regime falling in Damascus, and being replaced by more or less a Sunni force, be it radical, moderate, pro-Saudi, pro-West, pro-whatever you want, is for them an existential threat in the meaning that first of all, it will embolden the Sunni community in Lebanon, and change the balance of power in the country. Second, it will cut off completely their supply line of weapons, money, influence, etc. that is going from Iran through Iraq through Syria to Lebanon. And then also it is, for them, a danger of seeing what they call the "axis of resistance," which is today very debatable, being put into question. And the end of, probably, the balance or change of the balance of power in the entire region. Exactly the same symmetrically you can see it for the Sunni communities that are also perceiving Syria as an existential threat. For them, the survival of the regime, Assad's regime, means probably retribution against them, and probably the end of their political existence in Lebanon, and maybe for some of them their physical existence. We have to remember the Hariri assassination. And for the Saudis and for the Sunnis, let's say, access in the region curbing Iran and the Levant after the loss of Iraq, and after its hegemony over Lebanon, more or less, has to do with, in fact, completely debunking or breaking out the ring in Syria, i.e. putting down the regime. So for both communities, if you have to take this approach of a Sunni-Shi'ite fight in the region, which today partly the lens that you have to take, it is really becoming a zero-sum game between Shi'as and Sunnis. So it is understandable that the Shi'as of Lebanon are perceiving Syria as an existential issue, or stake. Now what is debatable is that a Lebanese faction that is participating in the political life that is a main player in the government and the state, takes unilaterally the decision to go and defend a regime which is, in fact, opposed by not half, at least a big part of the Lebanese polity. So this is putting Lebanon at risk, and under strain, and I don’t know how much Hezbollah is in face weighing this kind of risk. LANDIS: How do the Christians respond to this? Do they see the Shi'ites in their effort to destroy Islamic radicalism, that's the way the Shi'ites, of course, describe it, as protecting Christians as well? Or do they see it as undermining Christians. BAHOUT: You see, Josh, this is exactly the consequence of looking at only one layer of the conflict in Syria. In fact, for the Christians of Lebanon, the dilemma towards political change, towards authoritarian regime, towards freedom and democracy, towards ideas of rule of law, etc. 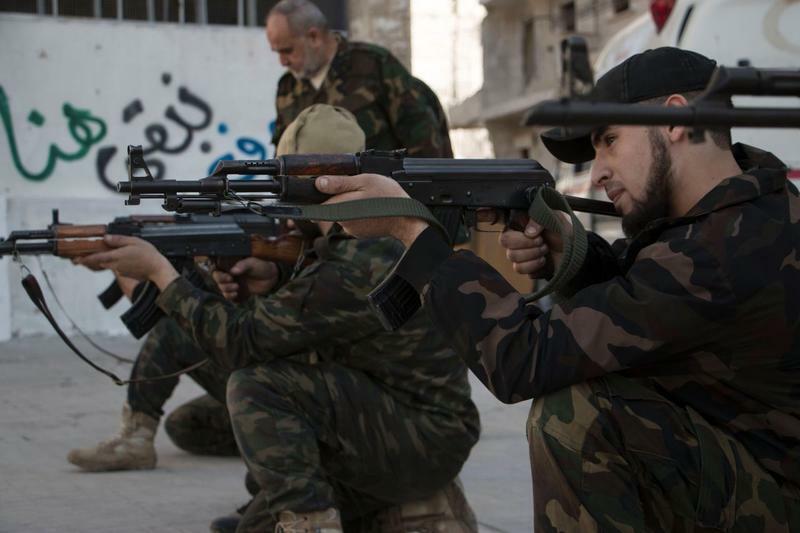 is really preceding the Syrian revolution. It's not something new. Now people are jumping into the Syrian case saying, OK, the Christians, by doing some very simplistic correlations. The Christians are afraid of Sunni radicals. Who is fighting Sunni radicalization? Supposedly the Assad regime and Hezbollah. So the Christians are with Hezbollah. This is very simplistic and very late in the conflict. For example, for the Christians of Lebanon, first of all, in the beginning of the war they sided with the Assad regime against the Palestinians and etc., because they were perceiving it as a defender. Then they turned against the Syrian regime because the Syrian regime was perceived as siding with the Palestinians and radical forces after the Camp David agreement. And then at the end of the war, the Syrian regime became the peacemaker in Lebanon, against what was perceived as the Christian interests, so they sided against it. So in fact, it's a constant oscillation. Now, this Christian dilemma of choosing, in a way, and it's a deadly choice I think. It's a deadly dilemma between the Sunni forces in the region and the Shi'a forces in the region, to put it very simplistically. As I think something of a suicidal choice for the Christians. They should step outside this - not be apathetic, but probably be more of a bridge-builder between the two than siding with one of the two. Because siding with one of the two will ultimately lead to the destruction, because one of the two is going to win, ultimately. And the winning of one of the two will really turn against the Christians that chose the other ones. So in fact, it's a very deadly choice, and I don't share it personally. But let's say that today, the Christians of Lebanon are probably torn half and half between defending sometimes against their deep conviction to the Syrian regime, [and] understanding Hezbollah's action in Lebanon. Some of them are very enthusiastic toward that. Under the label of, OK, this regime is awful, but after all, it's better than Sunni radicals and etc. And others are saying, after all, as Christians who are believers in the codes of freedom. Maybe democracy one day. People's emancipation, and etc. This regime has been terrible. The Syrian population has revolved. We have to side with these people, and bet that in the long run, the kind of pluralism and democracy will reign over the region. It's maybe naive, but it has at least the advantage of sticking to values and principles. So both are defendable on the ground of tactics and strategy. Now, of course, it's a political choice that is very costly and very risky, because the one that will lose within this half of the Christian community will lose not only maybe politically, maybe will lose physically or something. GRILLOT: So why don't we turn to this issue of international crisis that is growing here. I mean, I appreciate what you're saying about the multiple layers and how this thing has expanded from an internal conflict in Syria to having significant international implications. So now we see a good number of states now intervening in this case. We have a lot of those in the region, we've mentioned Iran, obviously Saudi Arabia is engaged in some way, shape or form. You mentioned Russia, Turkey. But there's also this kind of spillover effect of a lot of refugees and displaced people leaving the region and heading toward Europe, and the Europeans. And Americans now having to decide how and to what extent to intervene. They've been involved in some way, shape, or form, but nothing like what others in the region are. So what are we to make of all of that? This is a really growing crisis to the extent that it's really expanding well beyond the region and including players from all around the world. What are we to expect of that? BAHOUT: You know, it's very easy four or five years later to say we have said it in the beginning. But in fact, we have said it. People like Josh Landis, me, any other so-called "expert" on the Middle East and Syria have said since the beginning that if this fire is not extinguished quite quickly, and this conflict really solved or confined to an acceptable level, it will become unbearable and unmanageable on the regional levels, and maybe on international levels. We've been saying that, and you can find the traces of what has been written. And no one wanted to hear about that. And I'm quite severe, and harsh on the U.S. administration. I'm not talking about intervention or not, but the Obama rationale that was saying, in fact, we can't do anything about Syria. What we have to do is confine it and probably contain it in its own limit, and then wait for it to extinguish, has proven completely wrong. Because this conflict cannot be contained. And we all knew that it could not be contained, because first of all, Syria was a kind of appealing case for every other conflict in the region. The Iranian conflict with the Gulf, and the Iranian, let's say show of force with the West on the background of the nuclear agreement that was solved, ultimately. Turkey vs. Iran. Turkey vs. other Arab states. Arab states vs. Arab states. Sunnis against Shi'as. Russia wanting to play a role on the international scene that has nothing to do, in fact, with Syria. All of this was in fact sunk and pumped into the Syrian conflict. On the reverse side, Syria was also the generator of a lot of conflict. It is generating refugees. It is generating conflict, duality, and tension in Lebanon. Probably in Turkey. Maybe tomorrow in Jordan, and it has a link with Iraq. We have, not to forget, ISIS - this famous ISIS that we are talking about today came from Iraq, not in Syria. And then it brewed in Syria and then it grew up in Syria, and anybody who knows a little bit about the Middle East knows that nothing can be contained within borders. So this is a way of saying that probably today, to reshrink the conflict toward a Syrian level, and toward Syria, contain it, and maybe extinguish it. The international community has to be much bolder in its approach. And today, in a way, subcontracting the conflict to those Russian intervention today in the hope that the Russians will pull out a rabbit from the hat and put a political solution on the table, is once again, after five years, a new naiveness in a very long series of other naiveness. GRILLOT: Well, Joseph, thank you so much for being here today and shedding light, once again, on this very complicated situation we're facing in the Middle East. Thank you. BAHOUT: Thank you for having me, thanks. This week Russia launched its first air strikes in Syria after the country’s parliament approved the use of military force to combat Islamic State militants. The move comes just days after Russian President Vladimir Putin and President Obama met at the UN General Assembly.